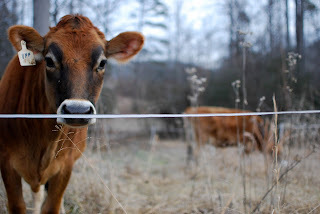 Have you ever heard of intensive rotational grazing? Google it. The short story is that you set up small "paddocks" for cows to move through so that they have to graze 1 small area and then they don't return to that area for a long time, giving the grass time to recover and grow back with the help of the fresh manure deposited there. It is genius. I've got lots of great cow chasing stories to tell soon. Some involve donkeys too, but they all involve one mischievous and beautiful cow galloping freely and gayly through an open field, heals literally clicking in the air as they go. Michael, we've followed your adventures with great interest as we've been praying about/planning for a similar change in lifestyle. I would love to talk to you about your experiences. I look forward to hearing from you. Yep that's good stuff man, especially if you don't have a lot of land (30 acres or less - like me). I actually saw one plan in which the paddocks were formed in a sort of "wheel" plan, where basically each fence line was like a spoke in the wheel, and a pond at the center was the hub cap (so no matter which paddock the cattle were in at one time, they always had access to that water source). This guy claimed he was raising 50 head on 10 acres that way.